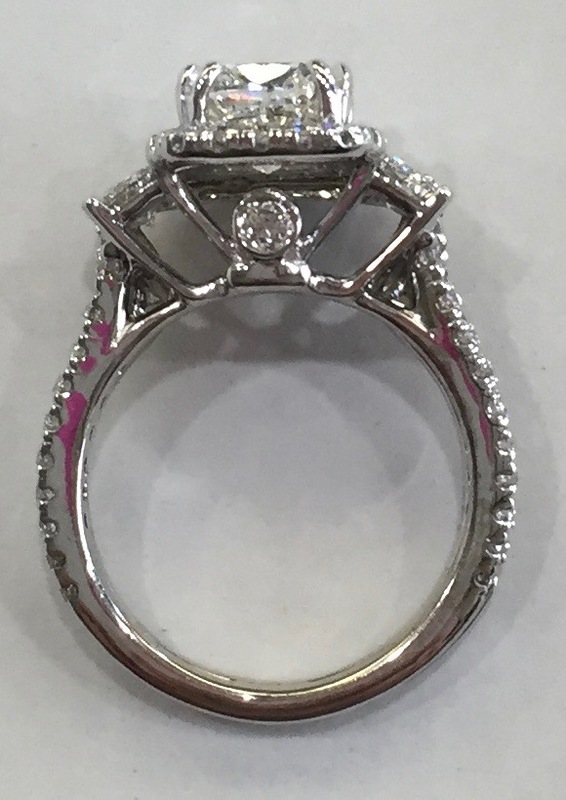 Wanting a bigger look for his fiance's wedding ring, this guy chose to add a custom made wedding band to come up and around each side of the halo engagement ring which was also bought at Julee's Jewelry. 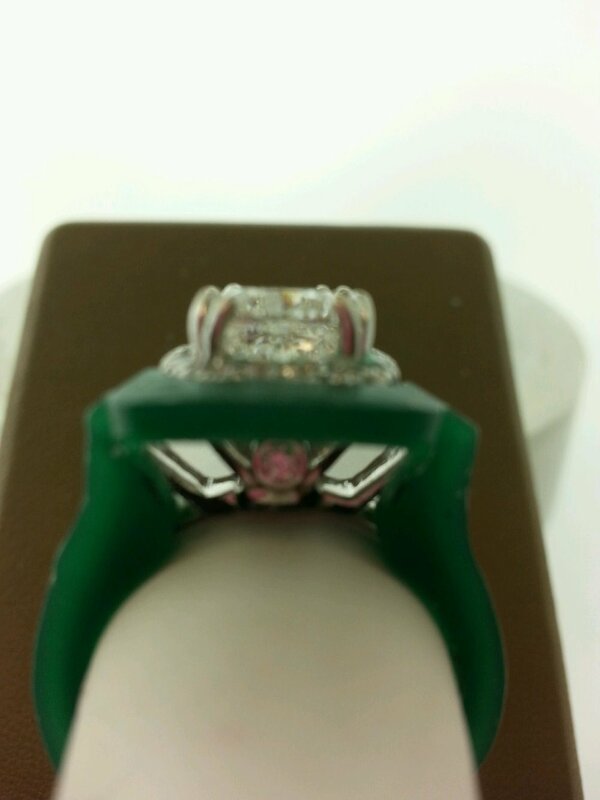 This ring is stunning in person!! With their 25th wedding anniversary coming soon, this couple decided to go with a custom designed pendant with a blue stone and a few small diamonds. Julee had her look at several blue stones of varying tones. 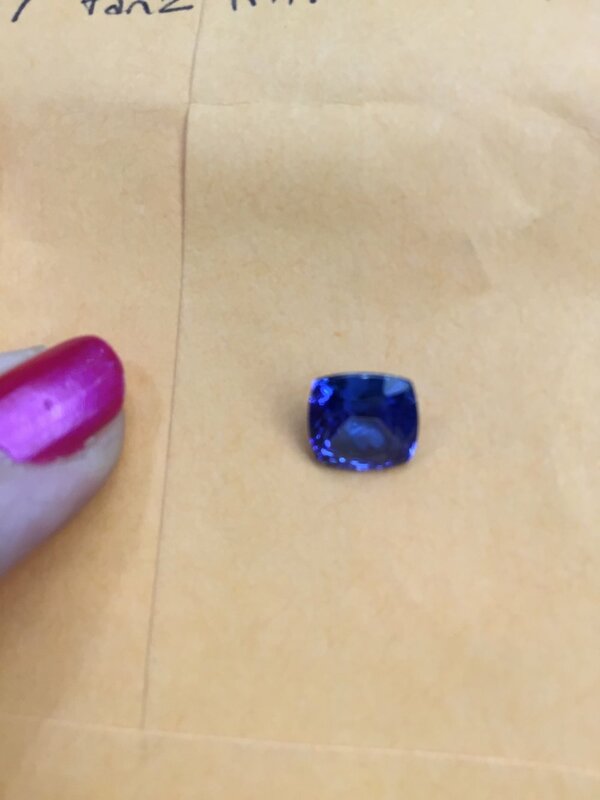 Narrowing it down to a gorgeous trillion sapphire the design work began. A simple "V" of small diamonds to add a slight accent to the gorgeous tanzanite was the perfect touch. Knowing his girlfriend loved rubies, this customer wanted to design a special engagement ring that she would love. He found the perfect center stone and then decided to put light-colored rubies in a halo setting around the center. He wasn't sure if he wanted rubies and diamonds to alternate or just rubies. It was special and unique; and he helped create the look in Julee's Jewelry Custom Design Center. Another customer wanted a black diamond halo for his fiance, because she loved black diamonds. Wanting a unique ring with black and red, this customer found a look on the internet, although it wasn't made from a product that would last long at all, he wanted it for an engagement. He decided to sit at the custom design computer in our Design Center and helped to create just the look he wanted. 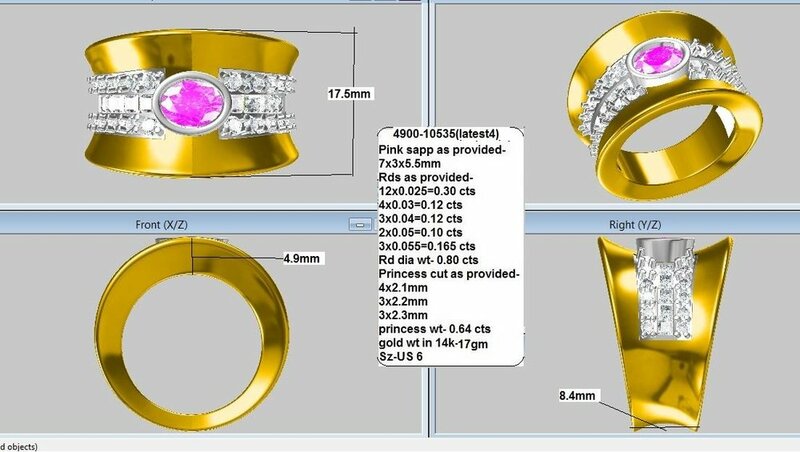 Having the option to see the ring in white, gold, yellow, gold and rose gold on the computer he was able to see exactly how the ring would turn out. They both loved the ring knowing he had so much to do with designing it. As a special gift for her sisters our customer designed a charm bracelet for each of them. The five sisters travel together and and plan many events to spend together. To memorialize their bond with each other and many memories throughout the years. she designed this bracelet, which includes their half sisters who have also been a part of their lives. REWORD???? When this customer wanted to propose she wanted the wedding band to represent her partner in a special way. We added the eye from Clockwork Orange and the musical notes of their special song around the band. Julee's Jewelry is known for our ability to breathe new life into older jewelry. Our talent for transforming old gems into stunning new pieces of jewelry is sought out and recognized. After inheriting a few rings she thought she'd never wear, this woman decided to use them to make a ring she'd always wished she had. An art deco cocktail ring. Starting from a very simple sketch, in the enda work of art was created. This wedding set was made into a bracelet for a bride-to-be as a gift from her mother. Her birth father had died when she was very young and this was the ring he had given her mother. The young woman was adopted by a wonderful man who helped to raise her. Her mother wanted it made into a bracelet so both of her fathers would "be there" to walk her down the aisle. Julee was able to make the affordable bracelet without ruining the rings. The solders to put the bracelet together can easily be opened and put back together as a wed set. Some people need to get a new wedding ring when the cost to repair can be close to, or more than, the cost to do a new mounting. Others just want a new fresh look for their ring. This customer had a beautiful marquise diamond and wanted to have it set in a new mounting for a special anniversary. She loves it! 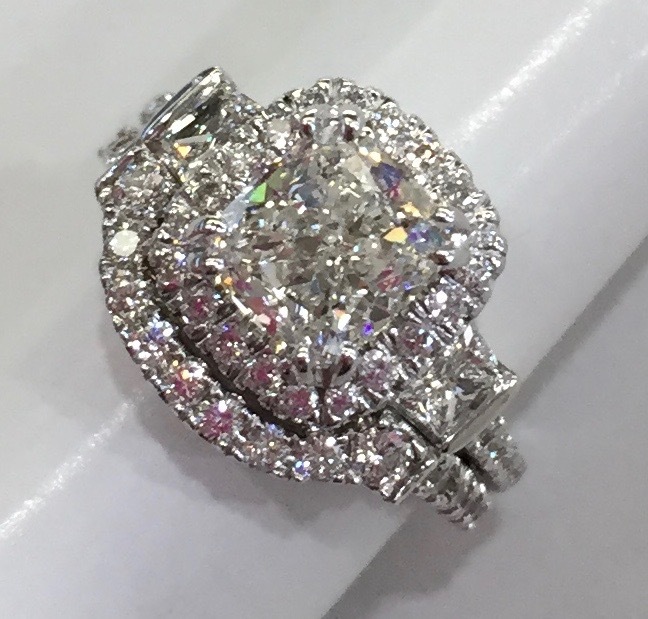 After this mom found out she was having her third baby, she decided to start having a very unique mother's ring designed at Julee's Jewelry. Using a lot of small diamonds she already owned, a spectacular ring was designed in rose and white gold with four connected diamond bands and the three children's birthstone's in the center. Her girls' stones look nice together too. When his wife passed a few months before Christmas, he decided to take apart her treasured grandmother's necklace and make a nice piece of mother & child jewelry for each daughter and daughter-in-law. Working with Julee each woman chose whether they wanted a pendant or a bracelet. Julee added a little larger birthstone heart to represent those moms and then attached each one's children's birthstone hearts to make new heirloom pieces from their Father and their Mother that Christmas. 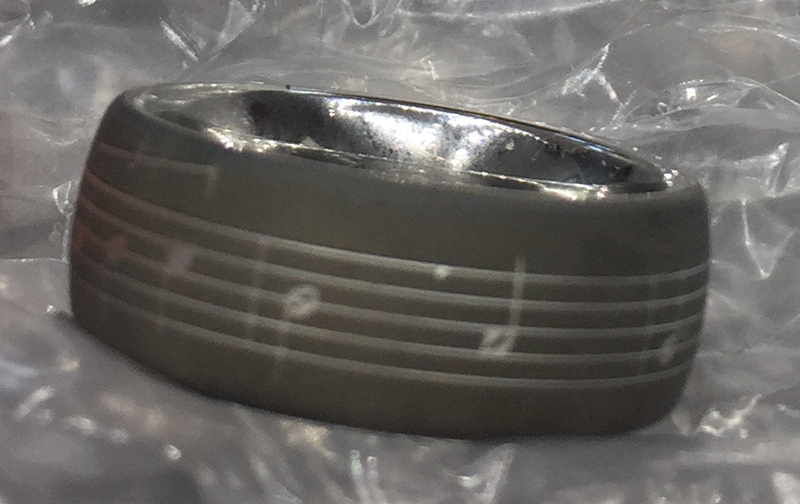 A bereaved wife brought in a ring that was special to her and to her husband. She wanted it restyled into a pendant she could wear to keep him close. She loved the pendant. It was so special it made her cry. Using her grandmother's, her mother's and her own jewelry a customer wanted to make a family ring to include all the women in her family and other sentimental stones. She wanted them to form an infinity symbol of family love and to have leaves on the sides to represent the family tree. 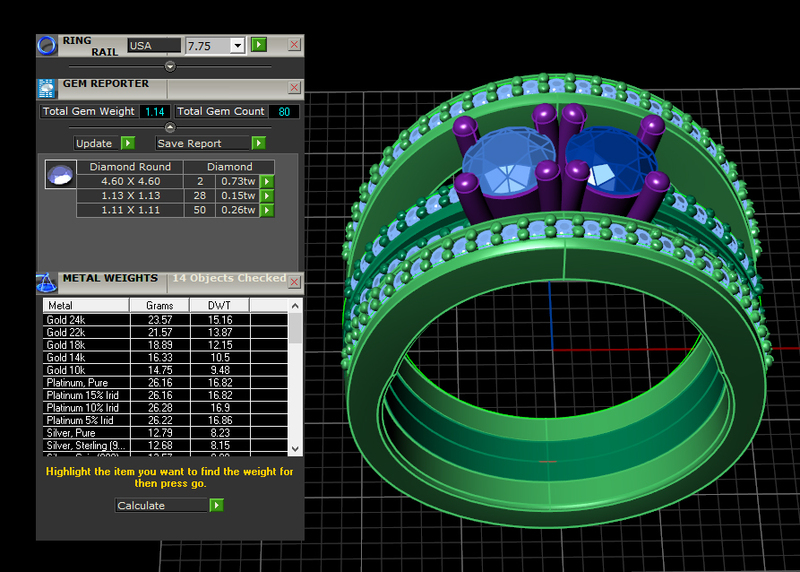 After some computer work the ring is amazing. Returning from a cruise this customer wanted to custom design a special ring from the pick sapphire she purchased on her vacation. She had some rings she wanted to trade in for scrap. So Julee used many of the diamonds from her rings and created this beautiful one of a kind fashion ring as a remembrance of her fantastic vacation. Sometimes people have a piece of jewelry they just don't like anymore. This customer had her center diamond made into a pendant and then decided to use the side diamonds to make another pendant with a sapphire in the center. She loved the idea of making her pieces into something she'd enjoy wearing again. Inexpensive cufflinks belonging to her dear uncle were made into a fine jewelry bracelet for his wife as a surprise for Christmas. Most stores would have turned this away! Julee chose to figure out an affordable way to make it work by drilling holes attaching 14K yellow gold rings and chains to make a bracelet. As Julee figured a way for the delicate chain to hold the larger cufflink stones, she thought it needed a little bit more to the design. She asked him if he knew if she had an extra diamond earring or other small diamond. Sure enough she had lost one diamond stud earring years ago and still had the other one. He was so happy with how it turned out and his wife was even happier to have such a sentimental piece that she could actually wear.